The BBC's world affairs editor John Simpson in Baghdad reflects on the day the former Iraqi President, Saddam Hussein, made a first televised appearance before an Iraqi judge. 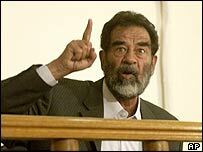 The moment when Saddam Hussein's handcuffs and chains were heard clanking outside the courtroom was almost unbearably dramatic. Yet when he entered, the effect the new government here had hoped to make was unexpectedly undermined. True, Saddam Hussein looked older and diminished and somehow haunted, yet there was plenty of his old imperious manner, and that was not at all what the government had wanted. The last image the Iraqi people had of him was when he was captured in December - filthy, dishevelled and utterly humiliated. The judge on Thursday banned the sound of Saddam Hussein's voice on television - but that merely gave the impression he was being gagged. And then some of the sound was made available anyway. The timing of it all meant the pictures aired on American breakfast television, and that spread suspicions here that it was really all about helping US President George W Bush in the opinion polls. Most importantly, Saddam Hussein was able to raise the whole contentious subject of the rights and wrongs of last year's invasion. That is something the Iraqi government could really do without. He was polite to the judge, but took the opportunity to score a number of points. "You shouldn't work for the coalition forces," he told him. Saddam Hussein also spoke about himself, as he often does, in the third person. After his performance some Iraqis sympathised with him, but others were glad that he had been brought to court. For the last six months he had begun to fade a little from the people's consciousness, but now he has reminded them very forcefully of his presence. The trial looks set to be very divisive. It won't bring the country together in the way many of us thought it might. Some Iraqis had wanted Saddam Hussein to be killed in various horrible ways. But he represents a sense of pride that even people who suffered under him feel. There is a complicated sense in which Iraqis are glad to be free of him, but already he has taken on a sort of nostalgic feeling of a great leader. It will be difficult for the new government to deal with him as swiftly and cleanly as they hoped they could. "Finger-jabbing and defiant, but in court"